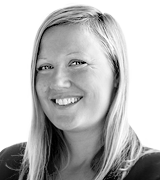 på Juni 18, 2018, 2:33 p.m.
With the World Cup set to kick off, YouGov have conducted an international survey among 8,000 football followers in 11 competing nations to find out the fans’ view ahead of Russia 2018. Around a quarter (24%) of football followers in the 11 nations think reigning champions Germany will lift the World Cup in Moscow on 15 July. Brazil and Spain are distant second (both on 14%) followed by France (9%). When asked how far into the tournament they think their own nation’s team would progress, people in Spain are the most optimistic. The majority (54%) of Spanish football fans with an opinion think their team will go the distance. 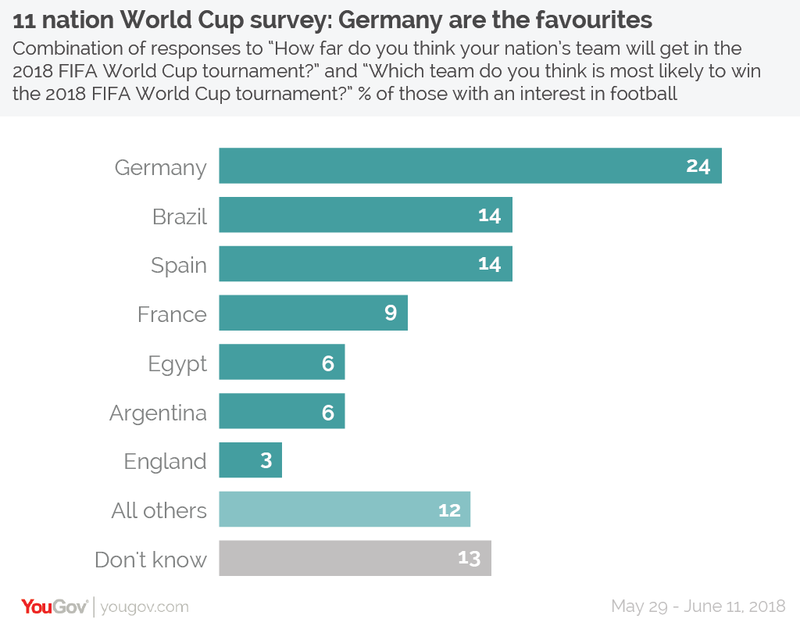 By contrast, only a third of Germans (35%) believe Die Mannschaft will win the tournament, while a quarter (25%) of French fans think Les Bleus will take the title. There is palpable optimism among football fans in the Middle East and North Africa. 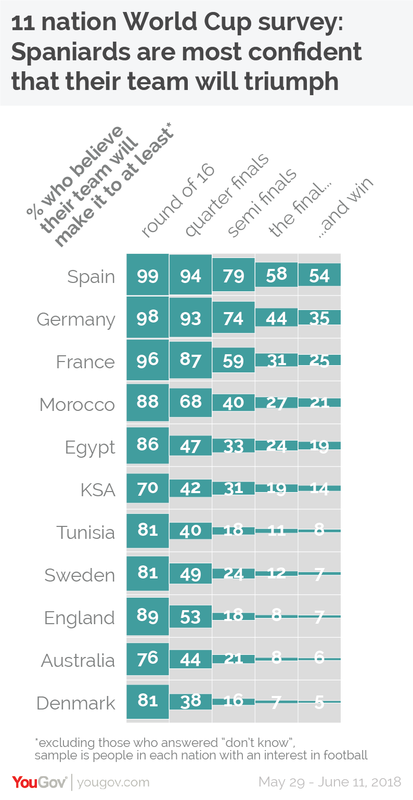 One in five (21%) Moroccan fans with an opinion believe their side will win, despite sports data firm Gracenote giving them just a 1% chance of lifting the World Cup. Likewise, 19% of Egyptians think their side will win and 14% of Saudis expect success (Gracenote put the odds for both teams lifting the trophy at 0%). Who will get the Golden Boot? 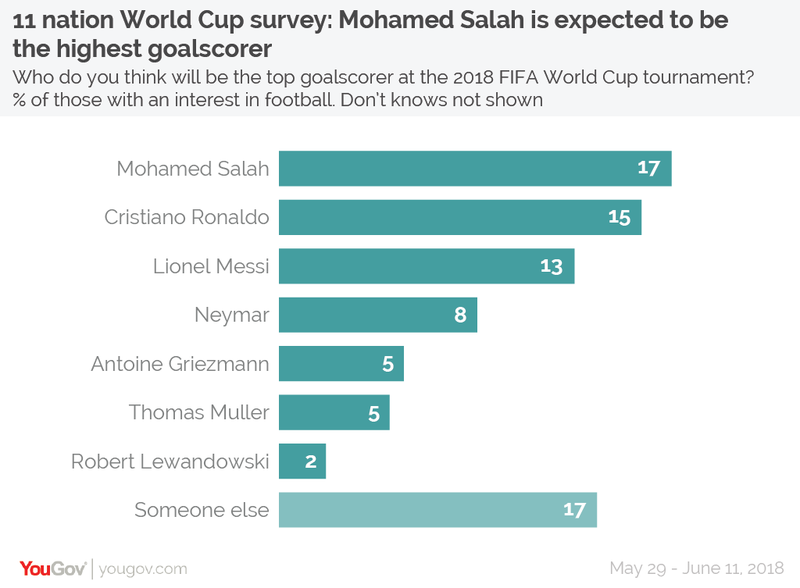 Mohamed Salah tops the table of who fans think will be the highest goal scorer. One in six (17%) fans across the 11 countries surveyed believe the Liverpool striker he will take home the Golden Boot. His figures are boosted by significant support from home: 52% of Egyptian football followers say he’ll take the prize. Cristiano Ronaldo is in second place (15%) followed by Lionel Messi in third (13%). Who will be watching most closely? 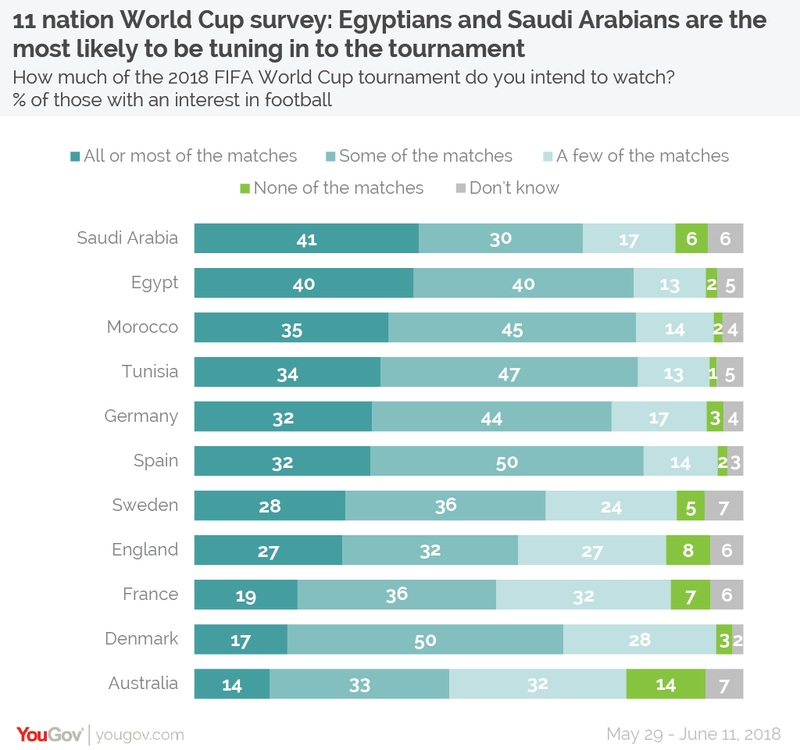 The most avid followers can be found in Saudi Arabia and Egypt, where 41% and 40% respectively of those with an interest in football say they intend to watch “all or most” of the matches. Australian football followers are the least likely to say they will follow along so closely – only 14% state they will. This is the same proportion that don’t think they will watch any games – the highest of any nation. The best World Cup goal of all time is hotly debated every four years. 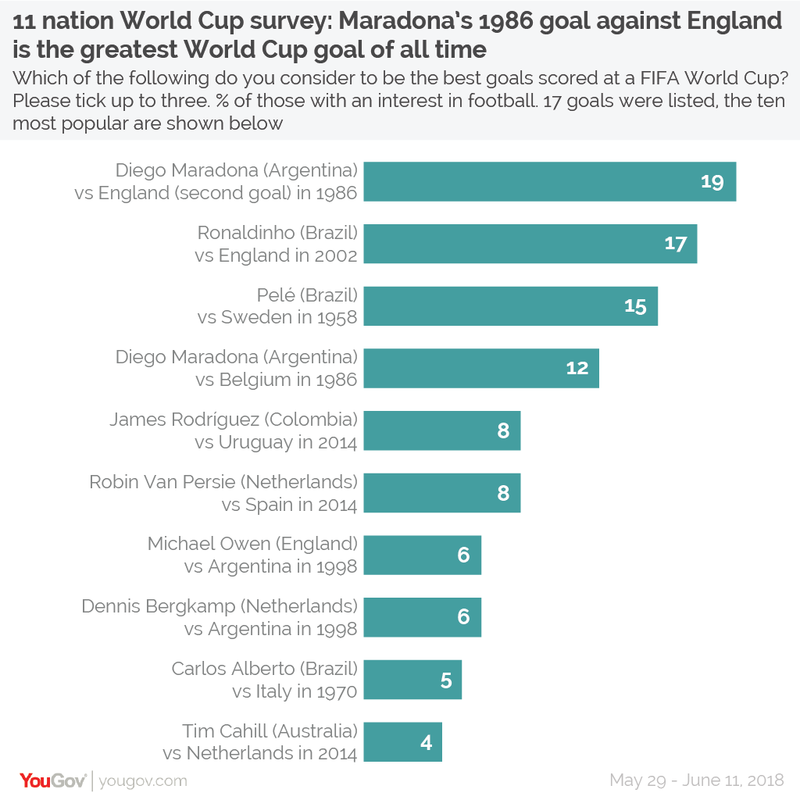 YouGov asked football followers to pick up to three goals scored at previous World Cups from a list of 17 and found that football fans rate Diego Maradona’s second 1986 goal against England (i.e. not the infamous ‘Hand of God’ goal) as the best (19%). Even 13% of English fans include the goal in their list. England suffer the indignity of being the victims of the second best goal on the list as well: Ronaldinho’s goal for Brazil at the 2002 tournament, which is chosen by 17% of respondents. (In contrast to the Maradona goal, the English are less enamoured with the Ronaldinho goal than any other nation, at 6%). Pele’s 1958 goal for Brazil against Sweden comes third (15%), with Spanish fans being particularly fond of this goal (29%). Maradona’s strike against Belgium in 1986 is rated fourth most-highly (12%) and is the only other World Cup goal to make double figures.